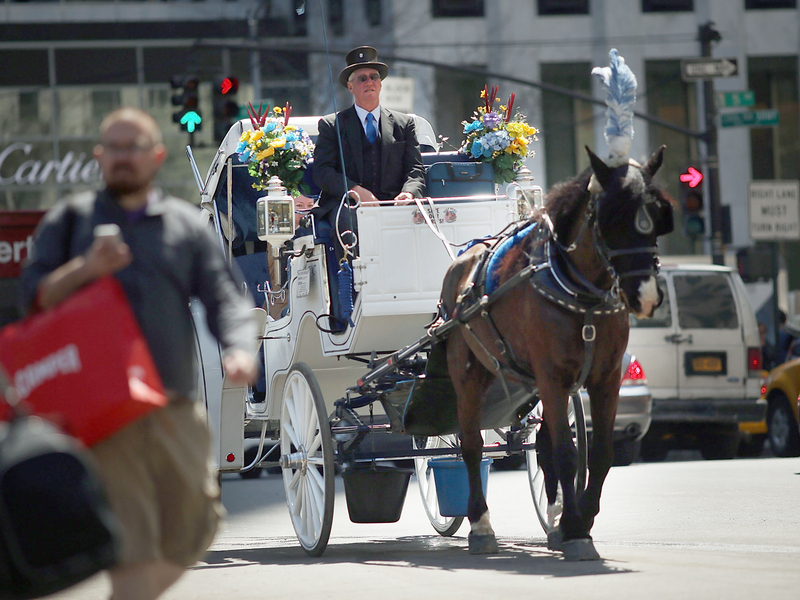 NEW YORK - Mayor Bill de Blasio is pulling back the reins on his plans to quickly get rid of New York City's horse-drawn carriage industry, stung by a recent outpouring of support for the colorful coaches that have clip-clopped their way through Central Park for more than 150 years. A campaign pledge to take on the horses during his first week as mayor was eclipsed by other issues. And as he nears his fourth month in office, he has encountered enough resistance from the usually compliant City Council to slow his plans again, now saying an industry he calls cruel and inhumane will be gone by year's end. For one, a media blitz led by actor Liam Neeson has portrayed the horse-drawn carriage industry as an iconic, romantic part of New York that provides about 400 jobs, many to Irish immigrants. In a series of editorials and TV interviews, he has said the operators treat their 200 working horses like their own children. "I can appreciate a happy and well-cared-for horse when I see one," Neeson wrote in an op-ed piece in The New York Times. "It has been my experience, always, that horses, much like humans, are at their happiest and healthiest when working." The next blow came when a series of city unions -- who usually are de Blasio's staunchest allies -- broke with the mayor, urging him to reconsider his decision in order to save not only the industry's hundreds of jobs but a profitable source of tourism. A recent poll revealed that nearly two-thirds of New Yorkers were in favor of keeping the horses at least in Central Park and were lukewarm on de Blasio's plan to put the horse drivers to work instead giving rides in old-timey electric cars. Last week, the city's newspapers piled on. A story in The Times on the unveiling of the $150,000 prototype electric car described it as "the industrial spawn of a rickshaw and Thomas the Tank Engine," while an editorial bluntly urged de Blasio to "let the horses and carriages alone." New York's Daily News launched a front-page campaign called "Save our Horses" that filled its pages with pro-carriage stories and an online petition that has recorded more than 11,000 signatures. For now, de Blasio and the animal rights activists who donated $1.3 million to his mayoral campaign are standing firm in the belief that the nation's most bustling city is no place for horses. People for Ethical Treatment of Animals launched an anti-horse carriage campaign with celebrities of its own, including Alec Baldwin, Pink and Lea Michele. Still, de Blasio has grown increasingly irritated by the number of questions he's faced about horses while trying to push other parts of his agenda. "I've said it many times over the last year so let me try one more time: I believe it's inhumane," he said last week. "Horses working on the streets of New York City ... it's not right. We should change it."